I'm sure you already know what "accessory" I'm talking about: the pick. While its effect on the playing speed and comfort is well-known to guitar players, its influence on the sound is only rarely considered a factor when tracking guitar. And yet, the choice of a pick is no small thing because not only does it affect the spectral response of the signal but also its dynamics. Make no mistake, this tiny and insignificantly looking thingamajig is in fact a formidable machine that does EQ and compression at the same time! Here's a brief demonstration: a recording of the same riff on the same guitar (Telecaster Road Worn '50s Blonde) with the same amp (Vox AC4TV) and with the exact same recording gear. The only difference is the pick used: 0.38 mm thick plastic pick on the first clip, 0.60 mm on the second, 2.0 mm on the third, and a wooden pick on the fourth (see image). Do note that I took the trouble of harmonizing the loudness for all clips so that volume differences wouldn't bias the result. As you can see, performance differences aside, the overall sound is quite different. The bigger the pick the clearer the attacks and, naturally, "thicker." From a frequency point of view, the increase in thickness highlights both ends of the spectrum. On the contrary, the thinner the pick, the smoother the sound. The attacks become thinner without disappearing completely and the spectrum is narrower, making the overall result "weaker." As for the material of the pick, it's easy to tell that the stoutness of the wood produces an admittedly generous attack, but also a "rounder" and "warmer" overall sound than with the plastic picks. 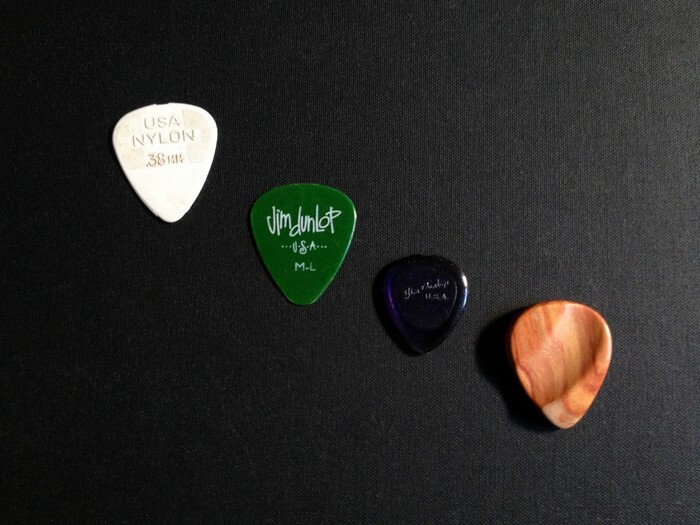 Ever since I discovered this trick, I carry with me a good collection of picks to every recording session. Changing picks is easier and faster than any other solution I can think of and the result sounds more natural to my ears. Try it out the next chance you have. Who knows, you might have the same revelation I had the first time I learned from it. It definitely won't hurt! 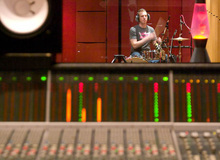 Join me next week to continue this chapter dedicated to recording electric guitar (but not only...)!